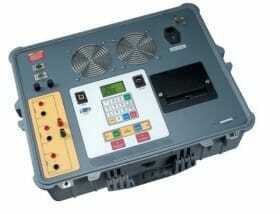 The QLTCA-40 is Amperis’ winding resistance meter and load tap changer contact analyzer. The QLTCA-40 is designed to accurately measure the winding resistance of highly inductive power transformers. The unit’s triple resistance reading input channels can measure three winding resistances simultaneously. Two-wire (Kelvin) connections provide high accuracy and require no lead compensation. A special feature of this device is its ability to measure and graph the resistance trace of a transformer LTC or voltage regulator contact during operation. One resistance input channel is dedicated to this feature. The QLTCA-40 provides stable resistance readings of very large transformers by utilizing a 60 Vdc power supply capable of outputting a test current up to 40 Amperes.